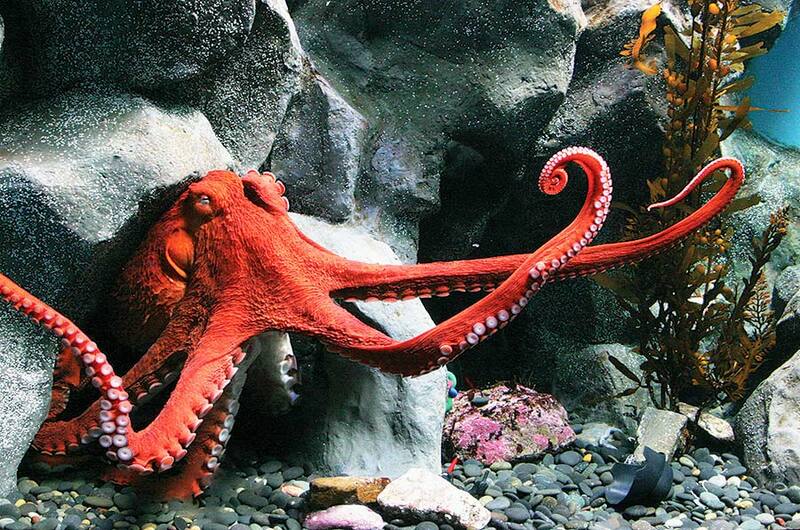 Today I want to write about a really cool octopus, the giant Pacific octopus. With an arm span of up to 6 metres and a weight of about 50 kg, the giant Pacific octopus is the largest species of octopus in the world. Like other species of octopus, they can change colour and have excellent eyesight. Despite their massive size, their soft body can squeeze into tiny holes in rocks and reefs. A fully grown adult can squeeze through a hole the size of a lemon. They are very intelligent and use a range of strategies to catch and eat their food. They can use their powerful beak to bite through clam shells, use their tentacles that have over 200 suckers to pull apart crabs or use a small tube to inject a paralysing toxin into tough to open shells which causes the muscles holding the shells to relax and enables the octopus to eat their meal. These guys hunt at night and have a wide ranging diet, including crabs, clams, squid, other octopuses, fish and even medium sized sharks. At breeding time, the female lays up to 100,000 eggs in small caves. The eggs are laid in small strings from the top of the cave and the female looks after them without eating for six months until they hatch. She will clean the eggs from parasites and fan them with water. The little babies are about the size of a grain of rice at birth. Giant Pacific octopuses are quite common and live in the north Pacific Ocean in the shallow, cold waters of Canada, the Unites States, Korea, Russia and Japan. Are there any other interesting facts that you would like to share about giant Pacific octopuses?